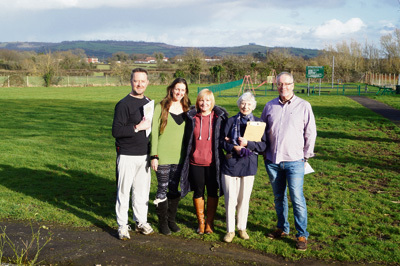 Residents battling plans to strip land to the east of Keynsham of its green-belt status to allow development are urging others to join their campaign at a meeting this month. On July 10, Bath and North East Somerset councillors will decide whether to back the core strategy document that outlines where new homes will be built over the next 15 years. It follows the news that an independent planning inspector who assessed the proposed strategy, which allows for around 13,000 extra homes to be built across B&NES and removes four sites from the green belt, has said the document is “fit for purpose”. Green-belt fields to the east of Keynsham, close to Wellsway School and adjoining the A4, have been earmarked as a potential site for 250 new homes by the council. The Friends of Breaches Gate group will be calling for the land, which they say has been used for recreation for more than 50 years by local people, to be protected. Friends member Bob Elcome-Thorpe said the group was dismayed at the inspector's findings and hoped as many residents as possible would attend the July 10 council meeting to show the strength of feeling against the proposal. He said: “By removing that green belt and putting housing right up to the edge of the community woodland the very structure and nature of the meadows, open space and trees will be devalued. With housing up against it on two sides you will see depletion of nature within that area as it will drive away wildlife such as deer and remove small animals from the food chain for hawks and other birds. Another member, Peter Holland, said he felt the council had missed the opportunity in its consultation process to discuss with residents the potential for creating a “Keynsham Common” on the land, keeping a buffer of green space between existing homes and new ones. The group is planning to meet MP Jacob Rees-Mogg to discuss the issues and said they are still investigating the public consultation process on the core strategy. The loss of green-belt land around the town is also opposed by councillors for the area. Keynsham East councillor Marie Longstaff (Cons) said: “Bryan Organ and I are totally opposed to the prospect of allowing new house-building on the green belt between Keynsham and Saltford. We have consistently objected to these proposals and will continue to do so when the issue is debated by councillors on July 10. “Protection of the green belt is an important point of principle for us, but beyond that we are also very concerned about the impact hundreds of new houses could have on our local infrastructure, particularly the already congested A4. Following the feedback from the inspector, council leader Paul Crossley (Lib Dem), said: “Adopting the core strategy will have a number of benefits for Bath & North East Somerset Council and the wider community. “It gives a clear policy for residents and developers on the location and size of new developments which means we are better placed to resist harmful planning applications. It also helps encourage housing and economic growth in the right places and for the council to put in place. The core strategy will be discussed at public meetings on July 10 - the first at 4.30pm where the plans will be discussed by the Cabinet and then at 6.30pm to be debated at Full Council at the Guildhall in Bath.